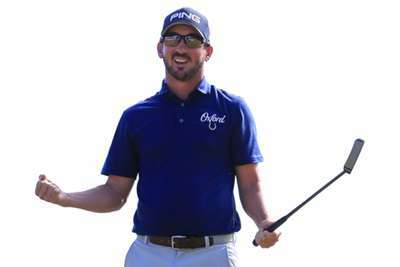 Andrew Landry held off a packed leaderboard to win the Texas Open by two strokes for his maiden PGA Tour triumph. A play-off loser to Jon Rahm at the CareerBuilder Challenge earlier this season, 30-year-old American Landry finally broke through following his four-under-par 68 on Sunday. Tied for the lead alongside two-time champion Zach Johnson when the final round teed off at TPC San Antonio, Landry holed four birdies on a perfect front nine before adding another at the 10th before dropping the 11th as he finished 17 under for the tournament. Landry fired four successive rounds in the 60s to deny Trey Mullinax and Sean O'Hair victory. Mullinax (69) – who set the course record with a third-round 62 – and O'Hair (66) split the runners-up cheque at 15 under in San Antonio. Fellow American Jimmy Walker surged up the leaderboard to finish fourth at 14 under. Walker fired a final-round 67 to record his first top-five finish since the 2016 FedEx Cup Playoffs. Without a win since The Open in 2015, Johnson – co-leader overnight – dropped to fifth and four strokes off the pace following his even-par 72.